The one and only complete handling solution for those riders who demand maximum performance and adjustability from their ATV. The Laeger’s Pro-Trax setup was created to provide the ultimate in strength and adjustability, resulting in a ride that is so responsive and so controllable you will wonder how you ever rode without it. The exclusive “T-pin” spindle system virtually eliminates stiction and drag produced by inferior ball joint systems. Increased cornering speed, Increased Speed over rough terrain, Increased Rider confidence. Laeger’s is proud to release its new maximum ground clearance A-arm. You can now float over the nastiest of terrain without a worry because this new A-arm system is designed so it stays up, and out of the way while still providing a perfect leverage ratio to soak up the bumps, and yet still provide a reinforced rigid a-arm that will take years of punishment. 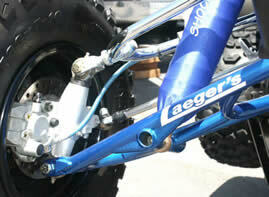 Laeger's also offer a wide range of Long Travel, Racing & Sport A-Arms to suit all abilities & ATV setups. Whether you race MX, Enduro, Flat Track or Street you'll improve your handling with a Laeger front end. 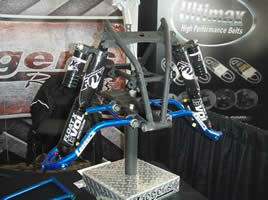 Laeger Racing is the original innovator of the Anti-Vibe steering stem. Experience increased comfort and less rider fatigue with an original Laeger Anti-Vibe steering stem. All Laeger stems feature 4130 Chromoly construction and are much more resistant to bending and twisting during a crash. 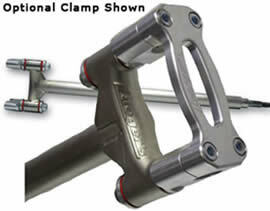 If you are an aggressive rider, a stronger steering stem is one of those MUST HAVE items. All Laeger stems come standard in a silver heat treated thermal finish. 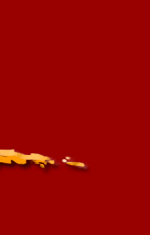 This finish is far more durable than any powder coat or painted finish.